In my post on skincare, I mentioned my homemade beeswax balm that I keep by my bedside to protect lips and cuticles while I sleep. I’ve always found beeswax has provided a superior balm for my lips. I lick and bite my lips and drink often, so I sometimes find it hard to keep my lips from getting chapped. Add the cold weather to that, and you have a recipe for flaky, sore lips. This does not give a nice canvas for lipstick, one of my favorite makeup items, so I generally have close to a half a dozen little tubes of lip balm around me in purses and drawers and makeup bags. But I’m so picky about the balms I like that I decided to make my own. 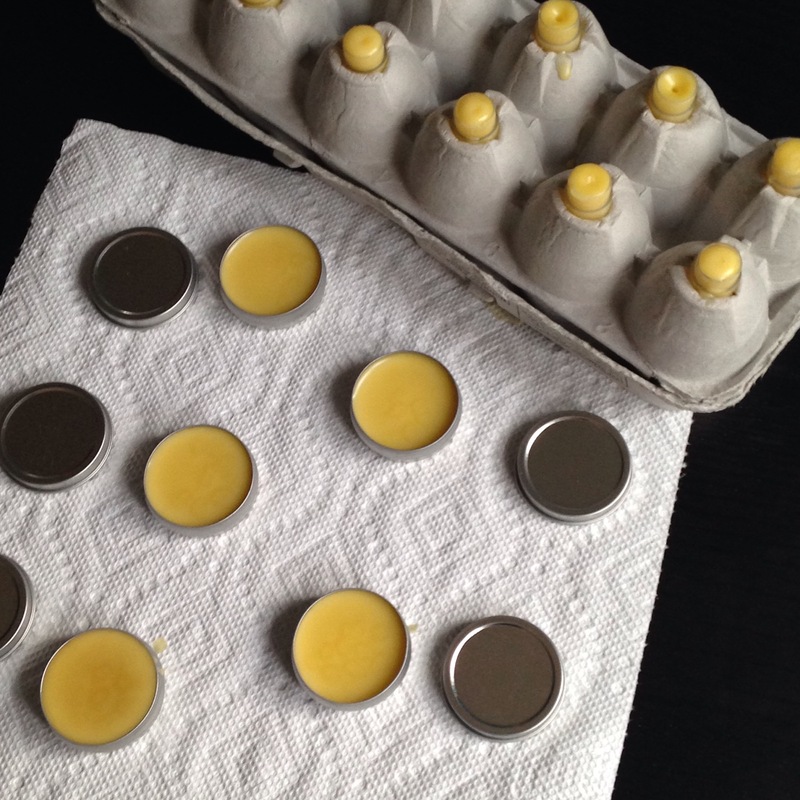 I based this balm in on recipes I found online, but adjusted it for my own preferences. Many recipes include shea butter, which is a wonderful butter for a lot of people. The problem is that I find it makes me break out, and because I wanted this to be a sort of all-purpose balm, I needed all the ingredients to be friendly to my entire person. I chose avocado oil because it’s full of good fats, but doesn’t have as strong a smell as olive oil, and I’m planning on giving this batch away as gifts. Any other neutral oil would probably work, or you can try olive oil and see if the smell bothers you. And unrefined, yellow beeswax, gives it a lovely faint honey scent. I include a bit of Vitamin E as a preservative. This is really an all-purpose balm, meant to protect any skin that is feeling dry or chapped. I mostly use it on lips and fingers. I keep a tin of it next to my bed, and a tube of it in each of my purses. Before I go to bed, I scratch out maybe the tip of my thumbnail’s worth and rub that on my lips, and then use a whole thumbnail’s worth to dab onto each fingernail so I can massage it into my cuticles. This is a very waxy, rich balm, so feel free to increase the oil to 2 oz. if you want something a little softer. I like the firmer balm, especially in the winter because it really protects skin from the elements. I’ve been known to put a little on my nose when I’m out on a cold, windy day. You can also make substitutions for the oil and butter. A lot of recipes use coconut oil and shea butter. While there are vegan substitutes for beeswax, I’ve never found them equal in quality, so your mileage may vary there. I got my ingredients and the lip balm tubes from Wild Herb Soap Co. on Etsy, and my tins thrown into a random order of herbs from another source. To make the rig for holding my little lip balm containers, I used an old egg carton flipped upside-down. I plunged my sharpest paring knife into the center of each cup in an X, and then turned the knife around and used the knob on the handle to open up each X to fit a tube. It’s really quite a handy way to keep the little guys steady while filling them and cost me nothing beyond the eggs, which I would have eaten anyway. Heat the wax, butter, and oil just until everything melts, stirring often. Add the Vitamin E and stir in. Fill containers. Makes about 1/2 cup of liquid, by volume.